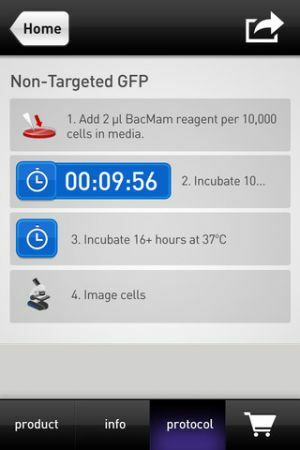 Molecular Probes Cell Imaging Guide with Protocols? 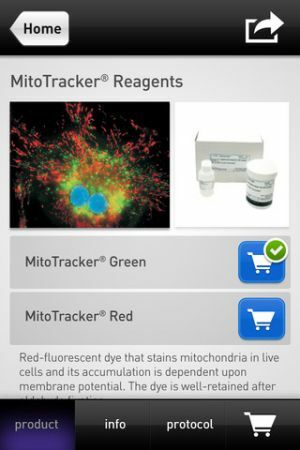 This mobile app is designed to help you find fluorescent dyes, reagents and protocols for cell biology related fluorescence microscopy applications.�? 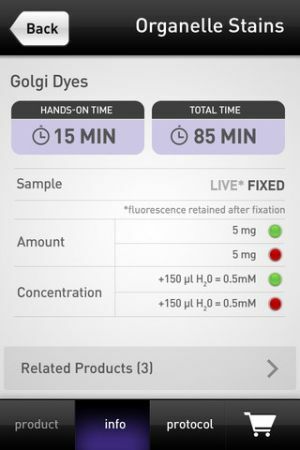 This mobile app is designed to help you find fluorescent dyes, reagents and protocols for cell biology related fluorescence microscopy applications. ? 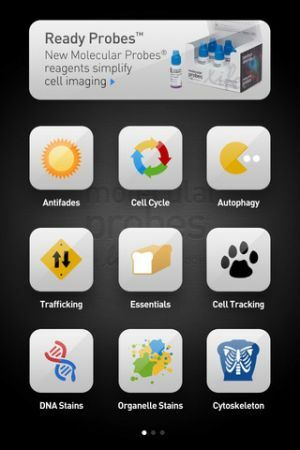 ?• Selecting science protocols for labeling organelles and cellular structures such as: Golgi, mitochondria, nucleus, endoplasmic reticulum, plasma membrane, actin, tubulin, peroxisomes, autophagasomes, endosomes and lysosomes without Spectraviewer. ?• Finding Alexa Fluor® labeled mouse, goat and rabbit secondary antibodies for immunocytochemistry and immunohistochemistry applications on Zeiss, Leica, Olympus and Nikon microscope systems. 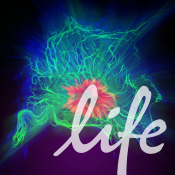 ?• Choosing calcium ion indicators, cell health assays, fluorophores and pH dyes for neuroscience, neurobiology and cancer research. 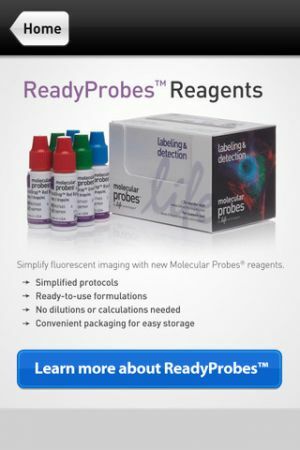 ?• Discovering which Invitrogen, Gibco or Ambion cell health, cell culture, or reactive dye kits are best for benchtop cytometry, tissue staining, or biotin streptavidin conjugation for microscopic labeling and detection. ?• Remote access to troubleshoot issues of: photobleaching, background fluorescence, and autofluorescence using signal enhancers, signal amplification, phalloidin conjugates, and click chemistry.? Aplicaci�n realizada por un laboratorio para ver y solicitar protocolos de an�lisis a artir de t�cnicas de microsocp�a de fluorescencia. Muy especializada para estudios superiores, los alumnos de 1� de bachillerato pueden reflexionar con ella y sus expectaculares im�genes sobre los avances m�dicos y la revoluci�n tecnol�gica.